TORONTO — With just handful of games to go in the regular season, Raptors coach Nick Nurse says certain players have to earn their minutes as he refines his playoff rotations. Norman Powell is one of them. Powell played up to the challenge on Tuesday, scoring 12 of his 20 points in the fourth quarter to lift Toronto 112-103 over the lowly Chicago Bulls. With the victory, the Raptors avoided what would have been the first time they'd lost three straight at home since 2015. "I just go out there and play," Powell said. "I'm not out there thinking 'Oh I've got to play well so I can play in the playoffs.'" You just go out and play the game you've been playing all your life." Six Raptors scored in double figures. Serge Ibaka had 16 points, Kawhi Leonard and Kyle Lowry had 14 apiece, Pascal Siakam chipped in with 13, while OG Anunoby had 10 for Toronto (52-23). The Raptors never trailed in their third victory this season — and eighth in a row — over the Bulls, who've already been eliminated from playoff contention. It was a humdrum night that must have had fans and players alike itching to get to the playoffs already. A reporter asked Nurse in the post-game press conference if he had a time machine to fast forward to the playoffs, the game was so dull. "You're right," Nurse said. "There wasn't a lot of juice in the game but, I don't know, we've got to play them, right?" 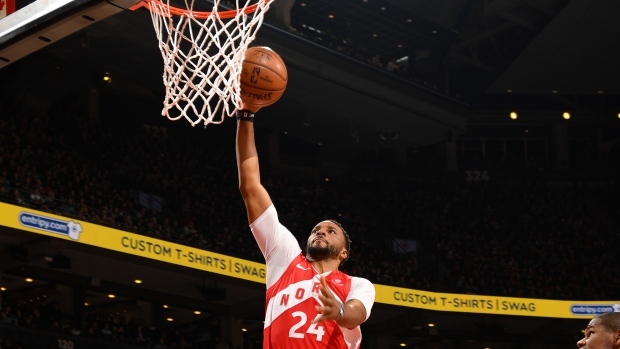 Toronto's 15-point second-quarter lead grew to 20 points in the third, and the Raptors cruised into the fourth quarter with a 85-72 advantage. A shaken Anunoby had to be helped to the locker room with 4:10 to play after Brandon Sampson landed hard on the Raptors sophomore under the hoop. "I was just dizzy," Anunoby said. Nurse went deep into his bench for the final few lackadaisical minutes. The Raptors coach said before the game that coaches motivate players with playing time — even moreseo with just seven games left in the regular season. "I thought Norm had not played very well and I wasn't going to use him and especially just give him his rotation," Nurse said. "We'll see, hopefully he'll play strong tonight and if he doesn't he won't play and that's going to go for a number of those guys as we go down the stretch. If they want to play, they're gonna have to earn their minutes." They key is making smart plays, Nurse said. "There is line you've got to ride between overdoing it and playing too passive," the coach said. "It's tough because (Powell's) natural instinct is to get that thing, put his head down and go to the rim, right? I think we need a little less of that and more at the right times." With the post-season just around the corner, Nurse was asked if Jusuf Nurkic's gruesome injury on Monday caused him concern about his star players getting hurt before playoffs begin. The Portland centre suffered compound fractures to his tibia and fibula, and underwent season-ending surgery on Tuesday. "I didn't see (the injury) and on purpose I haven't tried to watch it," Nurse said. "I can barely watch a guy twist his ankle. When they show those things and the slow 'em down, I'm like the turn-away guy. "You can't do anything. There's guys all the time . . . you just move on and business as usual, I think. Feel really bad for the player especially, the coach and the rest of his teammates." The Raptors were up 26-18 after the first quarter on Tuesday. Leonard led the way in the second with eight points, and a three-pointer by Powell with 4.9 second left in the quarter sent the Raptors into the halftime break with a 56-51 lead.